The story behind "Climbers on Elbrus"
A group of climbers is slowly heading up the lower ridges of mighty Mount Elbrus, the highest mountain in Europe. The summit is still another 2400m/8000ft higher.. The right (West) summit is higher – though only 20m/66ft- but the route goes through the rocks on the left (East) summit before heading west again. 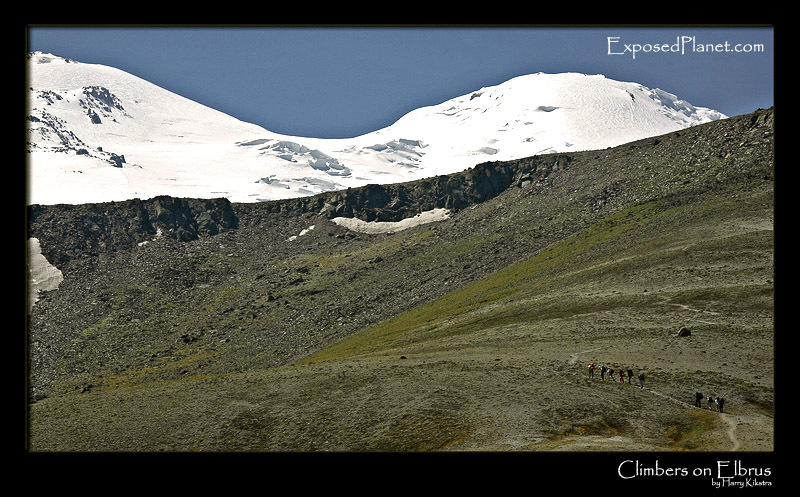 A group of climbers is slowly heading up the lower ridges of mighty Mount Elbrus, the highest mountain in Europe. The summit is still another 2400m/8000ft higher..The right (West) summit is higher - though only 20m/66ft- but the route goes through the rocks on the left (East) summit before heading west again.